Buies Creek – Campbell again practiced in shells (shoulder pads, shorts and helmets) on Monday, completing its fifth day on the field for preseason training camp. The Camels will go live on Tuesday, participating in their first full-contact practice of the preseason. 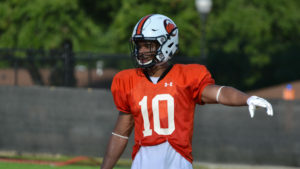 Redshirt junior defensive back Gerald Wilkes, Jr. practices Monday during preseason training camp at Campbell.